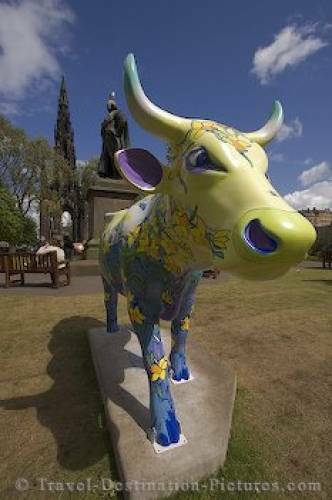 A cute yellow, blue and purple painted cow statue in the city of Edinburgh, Scotland, Europe. Like some other cities around the world, Edinburgh Scotland also had its "cow painting" event some time ago and they are now displaying the products of this art all around the city. in the city of Edinburgh, Scotland.